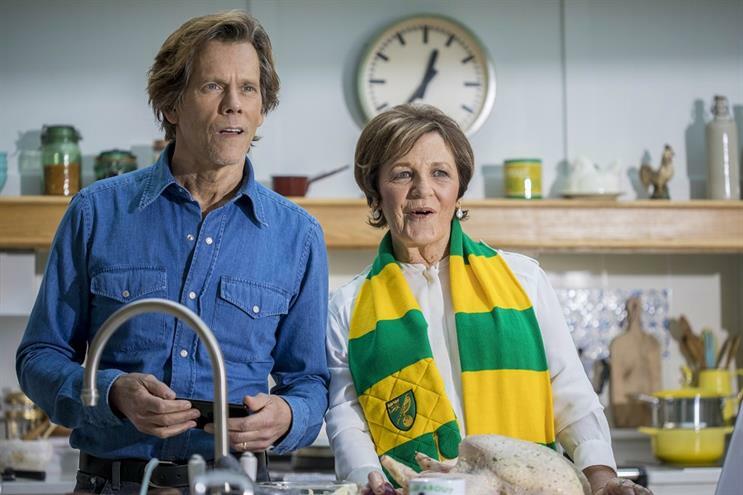 EE brings foodie legend Delia Smith into its latest campaign with Kevin Bacon to highlight its new BT Sport function that casts live action from phone to TV. Delia Smith is the latest Brit to star in EE’s brand campaigns, following Peep Show’s David Mitchell appearing in an EE ad set in a safari park in June. Capitalising on upcoming sports seasons, the newest ad – created by Saatchi & Saatchi and airing for the first time today (3 August) during Coronation Street – sees football fan Delia Smith cooking a roast dinner with Kevin Bacon while tuning into a game on BT Sport. It is the second ad in the "Who says you can't" themed campaign, with a third to follow later this year. The campaign leads with a 30-second TV ad that opens with Delia wearing her Norwich City Football Club colours and struggling with preparing a roast chicken while trying to watch a game on her laptop. Just as it would seem she is going to miss some of the action, Kevin Bacon strolls in with a bunch of carrots ready for roasting and shares EE’s new phone casting service, so the pair can watch all the live action on the TV screen in the kitchen. It was created by Will Brookwell, Will Helm and Mark Campion, and directed by The League of Gentlemen director Steve Bendelack through Hungry Man Productions. Media buying was handled by Essence. The campaign will run across TV, out-of-home, cinema and video-on-demand – with edits and content developed specifically for a range of digital and social channels, with a focus on Twitter, Pinterest and YouTube. Pete Jeavons, director of brand marketing at EE, said: "After an incredible summer of football, our customers can continue the football fever, and loads of other great sport, by streaming this season’s games whenever they like and wherever they are. "This new campaign shows just how easy it is for EE customers to now cast the action from BT Sport straight from their phone to their TV."